February is truly here, transitioning its way from deep winter to early signs of spring in the northern hemisphere. Violets are the symbolic flowers for February, beautiful purple petals, hardy in the face of frosts and snows and hopefully the incessant rain! In fact the Old English name for this month was “Solmonath” translating as the much less romantic “Month of Mud”. 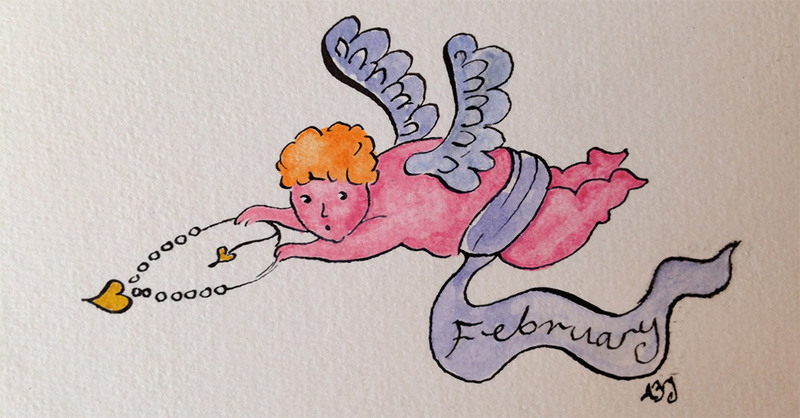 Love is in the fabric of February. It has sashayed its course through history from the wild feast of Lupercalia in Ancient Rome, where young men in goat skins whipped up fertility rites, to the calming Christianized celebrations of a nominated St Valentine, instigated by a concerned Pope Gelasius in 3rd century AD. Possibly Geoffrey Chaucer sprinkled the love potion in his ‘Parlement of Foules’ written in 1382, linking St Valentine’s Day to romantic love when birds choose their mate. In 1400 it is Paris, that well known city of love, that instigates ‘The High Court of Love’ on St Valentine’s Day, to deal with matters of Hearts encountering difficulties. During this time Charles, Duke of Orleans, writes the first recorded Valentine’s note to his beloved from The Tower of London. Not a good romantic outcome for Ophelia, but February 14th remains a day of joy and an opportunity to express feeling. By the mid 18th century card giving had gripped the Georgian world and by 1797 ‘The young Man’s Valentine Writer’ had been published suggesting lines of love and wit, while newly founded postal services allowed the tradition of anonymity to take flight. Card fever was high by the 19th century and cards could be mass produced. Rituals and traditions have sprung gently and turned into something of a commercial torrent! Flowers, chocolates and jewellery have associated themselves with this Saint’s day. In Finland and Estonia it is marked as “Ystavan Paiva” meaning ‘Friends Day’. There is a strong tradition of friendships and family relationships being celebrated in many parts of the world at this time, with children, parents and friends exchanging cards and gifts to mark their love. Striking at your heart – or so I hope. And lets you know that you are loved, oh, how you are loved. 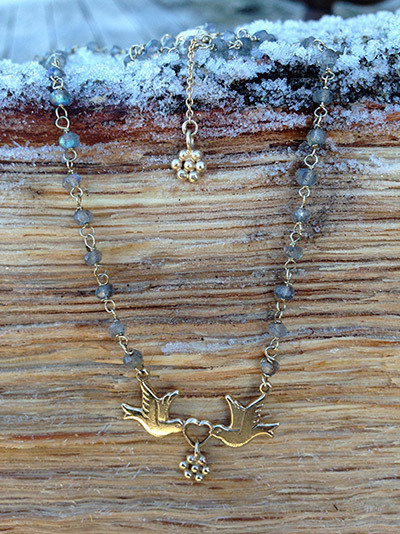 The necklace I designed is formed of a timeless vintage Danish gold flower pendant on a fine gold chain strung with vintage crystals, precious for it’s originality as well as the high quality of each part. It has since been sold. Creating a piece of jewellery that inspired such beautiful words was very special. Happy Valentine’s Day to everyone and I would love to hear if you celebrate it in anyway! Lucia Wilson is a British-born Anglo-Burmese writer of poetry, lyrics and short stories. Her first publicly released novella “The Karloff Tiara” is currently available on Amazon. 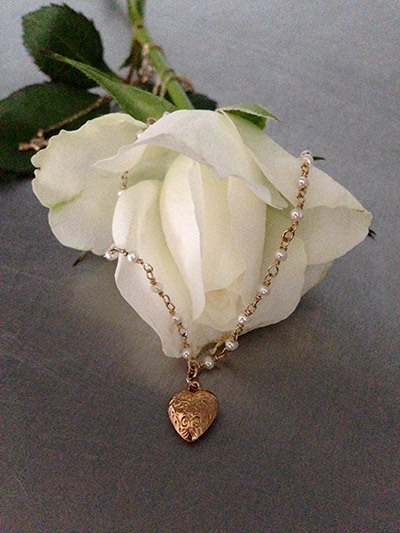 Welcome to the new website for Anne Bowes Jewellery!